The popularity of the neocon label on the European side of the Atlantic has grown considerably since the U.S. invasion of Iraq and the resulting notoriety surrounding the many pro-war ideologues in the administration of President George W. Bush. However, as use of the term expands in the United Kingdom and other European countries, an intriguing question arises: What exactly is a European neocon? Neoconservatism is widely regarded as a distinctly American ideological phenomenon, in part because at its core is a deep-seated belief in the moral righteousness of U.S. military force. However, neoconservatism’s roots are embedded in twentieth-century European history—notably in the authoritarian, antiliberal political philosophies of the 1930s and the U.S.-inspired and supported anticommunist propaganda networks of the Cold War era. And since the George W. Bush’s presidency, disciples of this ideological tendency have emerged across the European continent. These “Eurocons,” as they might be dubbed, share their U.S. counterparts’ devotion to military might and interventionist foreign policies. Although the unilateralism of U.S. neocons is tempered in Europe by a greater emphasis on the role of certain international alliances, the underlying vision is fundamentally the same. Eurocons see multinational institutions like NATO as vehicles for pushing the agenda of the United States and its European allies, and as instruments of global power, regime change, nation-building, and “democratization.” But they regard as illegitimate any attempt to check or curb Western power via the United Nations. This worldview is evident in declarations such as the Prague Charter signed at the 2007 Democracy and Security International Conference, the Statement of Principles of the Henry Jackson Society, and the Euston Manifesto. (For more on the Henry Jackson Society and the Euston Manifesto, see Luke McCallin, “The Henry Who Society?” Right Web, October 17, 2006). Representative Eurocons include politicians such as Conservative education spokesman Michael Gove and former Labour Foreign Office Minister Denis McShane in Britain; former Spanish Prime Minister Jose Maria Aznar and foreign minister Ana Palacio; former defense minister Antonio Martino in Italy; and foreign minister Karel Schwarzenberg in the Czech Republic. However, while the Eurocons share this central tenet about a Manichean struggle with Islamic totalitarianism, these European ideologues are a diverse bunch who would disagree on a number of issues. 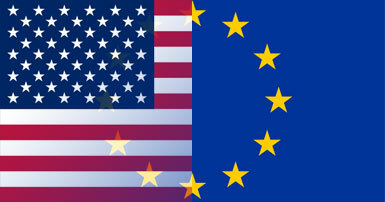 The Eurocons can be divided into three broad ideological tendencies, each of which has connections with like-minded political factions in the United States. The extraordinary influence of neocons in the top echelons of the Bush administration was paralleled by the emergence of like-minded policymakers across the Atlantic. Over the last decade, Europe’s own “establishment neoconservatives” have become entrenched in elite circles of policymakers and opinion-leaders. One of their main projects has been to revive the Cold War-era Atlanticist networks of hawks that first emerged to promote anti-communist, anti-Soviet propaganda. The “war on terror” led to a renewal of old Cold War battles on the European left between pro-NATO, pro-Iraq War Atlanticists and their traditional opponents in the peace movement. A new element was the role of European Muslim communities in the grassroots mobilizations that produced the massive demonstrations against the 2003 invasion of Iraq. Just as some U.S. neoconservatives, in seeking to forge new alliances, have overlooked the anti-Semitism of the Christian Right, so too have they embraced sections of the European far-right to create a populist “counter-jihad” movement. Caldwell’s observation unintentionally recalls the deep historical roots of the Eurocon worldview. Just as neoconservatism’s progenitors, the authoritarian political philosophers of the 1930s, blamed liberalism for the weakness of the Weimar Republic and the rise of the Nazis, so European liberalism—not Islamic extremism—is the real object of Caldwell’s contempt. Tom Griffin is a contributor to the UK-based Spinwatch (http://www.spinwatch.org.uk/) and Right Web (https://rightweb.irc-online.org/). 1. Peter Oborne, Is David Cameron making the same catastrophic mistake as Iain Duncan Smith?, Daily Mail, 26 October 2009. 2. David Blackburn, The Tories’ support for the war in Afghanistan owes nothing to neoconservatism, Spectator Coffee House blog, 24 October 2009. 3. Jim Lobe, What is a Neo-Conservative Anyway? Inter Press Service, 12 August 2003. 4. Prague Charter, Democracy and Security International Conference website, accessed 20 November 2009. Statement of Principles, Henry Jackson Society, accessed 20 November 2009. The Euston Manifesto, accessed 20 November 2009. 5. Michael Gove, Celsius 7/7, Phoenix, 2006, pp.127-128. 6. Christopher Caldwell, With friends like these, FT.com, 13 February 2004. 7. Jim Lobe, “A Neoconservative International Targets Iran,” Inter Press Service, Lobelog, June 9, 2007. 8. Christopher Caldwell, With friends like these, FT.com, 13 February 2004. 9. Christopher Caldwell, With friends like these, FT.com, 13 February 2004. 10. Christopher Caldwell, With friends like these, FT.com, 13 February 2004. 11. Henry Jackson Society, Statement of Principles, accessed 26 October 2009. 12. Geoffrey Wheatcroft, Obituary – Maurice Cowling, The Guardian, 6 September 2005. 13. Samuel Britain, Two Views of Foreign Policy Morality, Financial Times, 14 August 2006. 14. Peter Barron, 'Disastrous misjudgement? ',, BBC News - The Editors, 13 December 2007. 15. Tom Mills and David Miller, Réalité-EU: Front group for the Washington-based Israel Project? Spinwatch, 30 October 2009. 16. Ian Williams, "Casting the First Stone," Guardian "Comment is Free" blog, April 4, 2007. 18. Alan Johnson, The Worst Advertisement: The Socialists and the Iraq Election by Alan Johnson, Labour Friends of Iraq, 29 January 2005. 19. EVERYTHING CHANGED: What Now for Labor, Liberalism and the Global Left?, Social Democrats USA, 17 May 2003, archived at the Internet Archive. 20. Norman Geras, Introducing the Euston Manifesto, guardian.co.uk, 13 April 2006. 21. The Euston Manifesto, eustonmanifesto.org, accessed 6 March 2009. 22. William Kristol, A Few Good Liberals, The Weekly Standard, 1 May 2006. 24. Global Politics After 9/11: The Democratiya Interviews, p.xxiii. 25. Tom Griffin, The Neocons, the BNP and the Islamophobia Network, Spinwatch, 17 September 2009. 26. Toby Archer, Countering the ‘Counter-Jihad’, RUSI Monitor, 15 August 2008. 27. Speaker Biographies, Counterjihad Europa, accessed 26 October 2009. 28. Haaretz: Jews for Le Pen, Centre for Vigilant Freedom, 22 November 2007, via the Internet Archive. 29. Toby Archer, Countering the ‘Counter-Jihad’, RUSI Monitor, 15 August 2008. 30. Christopher Caldwell, Reflections on the Revolution in Europe, Allen Lane, 2009, p.286.